Athletes are an interesting tribe, with members who do amazing things. At every expo, race, and show, we meet folks who love to ride bikes 100 mountainous miles, finish one marathon and turn around to run another one, or compete in a little race called IRONMAN. illumiNITE fans are an impressive bunch and we’re proud to be associated with their greatness. Every once in a while we meet someone so amazing that we’re left thunderstruck and in awe. That’s how we felt about Fran Libasci. Fran visited our booth at a marathon expo and recommended our Ambition Women’s Hoodie to another customer. She liked the pullover because it worked out so well during her marathon in Antarctica. Hmmmm…intriguing. Fran was nice enough to talk to us about her running life and her experience racing at the bottom of the earth. Unconventional from the start, Fran began running in her early 40’s and completed her first marathon at the age of 49. Now retired, she and her partner complete dozens of marathons each year (with a personal record of 31 races, marathon length or longer, in one year). Having completed a marathon in all 50 U.S. states, Fran set her sights on the seven continents, and she’s halfway to that goal. The weather rules in Antarctica, and organizers warn runners that sudden evacuation is possible, finish line or no finish line. During her first race, Fran faced snow, ice and temperatures in the 20s (F). Unable to finish because of the harsh conditions, Fran vowed to return and then successfully finished the race-twice. Race conditions are tough on Antarctica and racers shouldn’t expect to set a personal record. Fran said most runners finish an hour behind their normal marathon time. 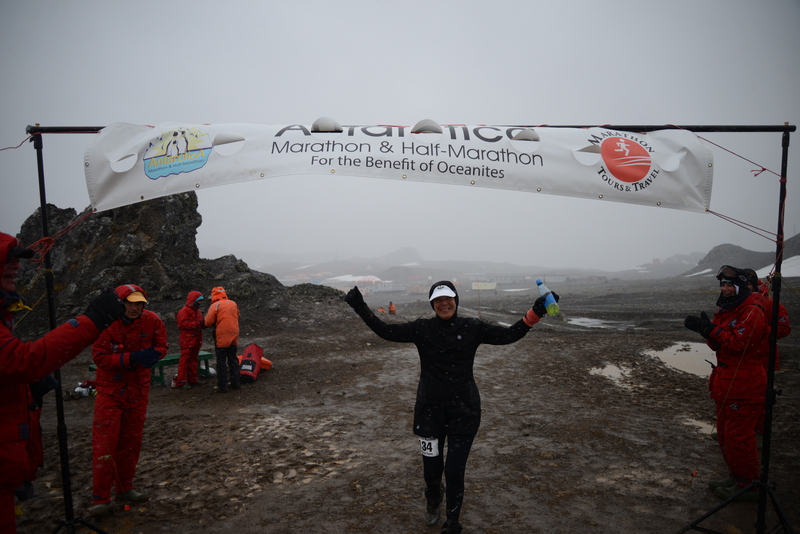 Antarctica is a fragile ecosystem and race organizers leave the course pristine. The marathon is run on King George Island, which Fran described as looking like the surface of the moon. Penguins make up most of the cheering section, although scientists from several international research stations often come out to cheer for the runners. Fran picked our Ambition Women’s Hoodie for the race because of its great fit, high thermal factor with no bulk, and its hood on top – perfect to keep her warm and toasty during the race. Fran is our kind of athlete: adventurous, good-natured, and motivated. Cheers to you Fran!! Good luck in Australia!